Missy B had a bit of a do at Battenburg Towers, to celebrate her and her chums getting through A level exams and results (more or less) unscathed and ready to embark on the next phase of their lives. It’s all very exciting and great to watch them growing up. Not quite grown up enough to eradicate all traces of the party without some help the next morning though. As she and I restored the kitchen to something akin to its former glory (aka moderate tidiness), Missy B made me laugh out loud when she told me, in horrified tones: “I’ve found two bottles of cider that people have opened and hardly even touched. It’s such a waste”. Once I stopped giggling, I agreed with her and promised her I would try to make use of what was left. And so I did. 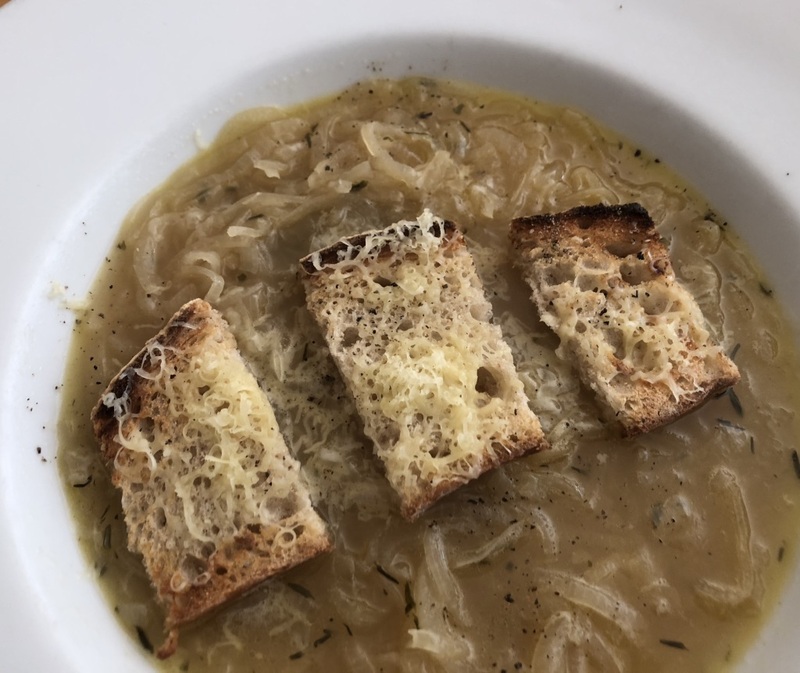 First I made an onion soup, a bit like French onion, but with cider. I thickly sliced the four onions that happened to be around and softened them in a generous slice of butter. I added about half a litre of chicken stock and the same again of slightly flat cider, a few sprigs of thyme and two bay leaves. I simmered it for about 10 minutes and then seasoned with salt and pepper. I could have blended the soup, but I decided it would be lovely just as it was. I had some slices of leftover baguette in the freezer, so I defrosted some of those, toasted and covered them in lots of grated gruyere. I thought this would be satisfying on ground of virtuousness at least – in fact it was excellent. Lighter than the traditional French way (which I do love) and sooooo tasty. But that only saw off one bottle, so I had to come up with something else. Inspired by Jenny of Silver Screen Suppers, who is constantly baking with Hammerton beer these days, I decided to try my hand at some cider bread. I looked at a few booze-based bread recipes and then found this one for cider bread with sunflower seeds by Ruby Tandoh, which I sort of followed. Combine the flours in a large bowl, crumble in the yeast and add the salt. Separately, whisk together the honey, cider and hot water. When the mixture is tepid, add it to the dry ingredients. Use your hands to roughly combine, then knead for a few minutes, until the dough begins to feel smoother and appears well combined. Add the sunflower seeds and knead lightly a little longer to incorporate all the seeds. Form the dough into a ball and place in a large, lightly oiled bowl. Cover with a clean tea towel and leave to rise for 1 hour or until it is roughly one and a half times its original size. Turn the risen dough out on to a lightly floured work surface and shape into a round loaf. Place the dough on a baking tray (also lightly floured). Leave to rise, covered loosely with a tea towel, for 45-60 minutes or until it has grown in size by half again. Meanwhile, preheat the oven to 200ºC/gas 6. Dust the top of the risen dough with flour and use a very sharp knife to score the top. Bake for 15 minutes before reducing the oven temperature to 180ºC/gas 4 and bake for a further 30 minutes. The sunflower seeds seemed to disappear but it was a pretty good loaf, great for a cheesy ploughman’s style lunch. 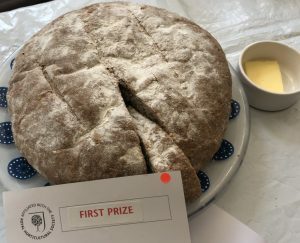 In fact, I popped it in the freezer, defrosted it in time for the Muswell and District Horticultural Society Autumn Show, where it got first prize in the bread category. Oh yeah. Thank you, wasteful teens, for inspiring me to try out some new ideas. I can testify that the bread was fabulous as luckily you were off on holiday so you generously gave me a bit. The soup sounds soooooo good and I think I have an ancient bottle of cider in my cocktail cabinet so am going to copy you in that idea! Will def try the cider onion soup as sounds delicious. And I’m also impressed you held a proper teenage party at your house. Were you permitted to stay in? Ah yes – it’s even worth buying a brand new bottle of cider for. Missy B and her chums are fairly civilised… We went out for dinner and were permitted back in the house at midnight!